DAY IN AFRICA welcomes high school juniors and seniors from across Wisconsin to explore the languages and cultures of Africa in a variety of sessions led by UW-Madison faculty, students, and staff. 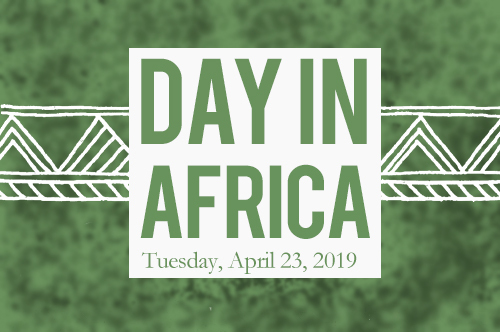 This year’s DAY IN AFRICA event will be held on Tuesday, April 23, 2019 at UW-Madison’s Union South. DAY IN AFRICA 2019 will feature a variety of interactive sessions, encouraging students to have fun as they expand their knowledge of the arts, music, and culture of many parts of the African continent. Registration is now closed for DAY IN AFRICA 2019. Please send us an email [outreach@africa.wisc.edu] to to be included on our African Studies Program Outreach email list to learn about future events, including DAY IN AFRICA 2020 and other outreach opportunities. Participation in DAY IN AFRICA is free to registered school groups. A limited amount of financial support may be available to schools outside Madison to help defray transportation costs. Contact the Outreach Coordinator for details. We’re looking for VOLUNTEERS for the morning sessions between 8:00AM and 12:30PM. Volunteers for Day in Africa will help us make sure the event runs smoothly, assist presenters, and keep time. We’re also looking for STUDENT AMBASSADORS from 12:30 to 1:15PM. Join us as a Student Ambassador for our lunch event (which includes a free lunch for you)! We would like UW-Madison undergraduate students to share their experiences and tips about college life with visiting high school students. Student ambassadors can also help them with questions and concerns about college life and/or about UW-Madison in general. If you’re interested in serving as either a volunteer or student ambassador (or both! ), please fill out this short form. A lunch event will be held from 12:30-1:15PM in which our undergraduate Student Ambassadors and visiting high school students will discuss the ins and outs of student life at UW-Madison. The African Studies would like to thank the Anonymous Fund and the Division of Diversity, Equity & Educational Achievement for their sponsorship of this event.